Here's an advertisement I saw recently as I was driving. Interestingly enough, when I pulled into the parking lot, there wasn't a customer in sight! 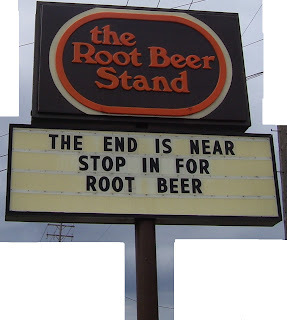 Nothing like an "End-Time Root Beer" eh? That's right up there with their "Free Hot Dogs Yesterday" sign, which also didn't make me want to stop. Ha...that one was actually kind of funny too...a little bit anyway.